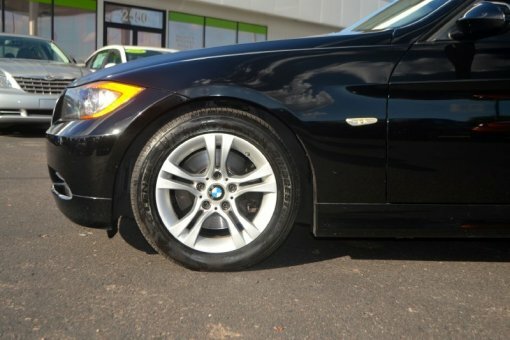 Check out this gently-used 2008 BMW 328i we just got in! Its loaded up with leather, sunroof and an impossible to find navigation system! This Bmw has been garage kept washed and waxed its a sight to see! Drive home in your new pre-owned vehicle with the confidence of knowing you're fully backed by the CARFAX Buyback Guarantee. In addition to being well-cared for, this 3 Series has very low mileage making it a rare find. Beautiful exterior. Clean interior. This BMW 3 Series is so immaculate it is practically new. Want a mobile theater? This 3 Series has a premium entertainment package that will keep your passengers entertained with superb enjoyment. You will never have to worry about keeping up with traffic in this 3 Series as it packs a beast under the hood. This 2008 BMW 3 Series 328i is not like every other 3 Series. The BMW was equipped with many of the added features that make this vehicle such a unique automobile to own and drive. Added comfort with contemporary style is the leather interior to heighten the quality and craftsmanship for the BMW 3 Series This 2008 3 Series 328i has extra options like the BMW navigation system. The additional feature will keep you safe and will make this 3 Series even more dependable. Unique and nearly impossible to find, this 2008 3 Series 328i is a collector's dream come true. The 2008 BMW 3-Series continues to be the benchmark against which other entry-level luxury cars are measured, mainly courtesy of its excellent driving experience. Power, braking, and handling are perfectly matched to the vehicle's size and intended usage. The way BMW takes care of business inside the cockpit also has a lot to do with the popularity of this breed. The 3-Series makes sure no buyer is left behind by offering four body styles, three engines, and both rear- and all-wheel drive. 2008 also will see the new M3 in coupe, sedan, and convertible form, adding racecar-like performance to the lineup. Interesting features of this model are the near-supercar M3., wide variety of bodies and drivetrains, the best inline six-cylinder engines for those who love motoring, and Driving pleasure par excellence.